From The North Face, "Quite possibly the warmest and most comfortable slip-on bootie on the planet, this 700 fill power down insulated bootie can withstand winter tromps at Everest Base Camp, and anywhere else. 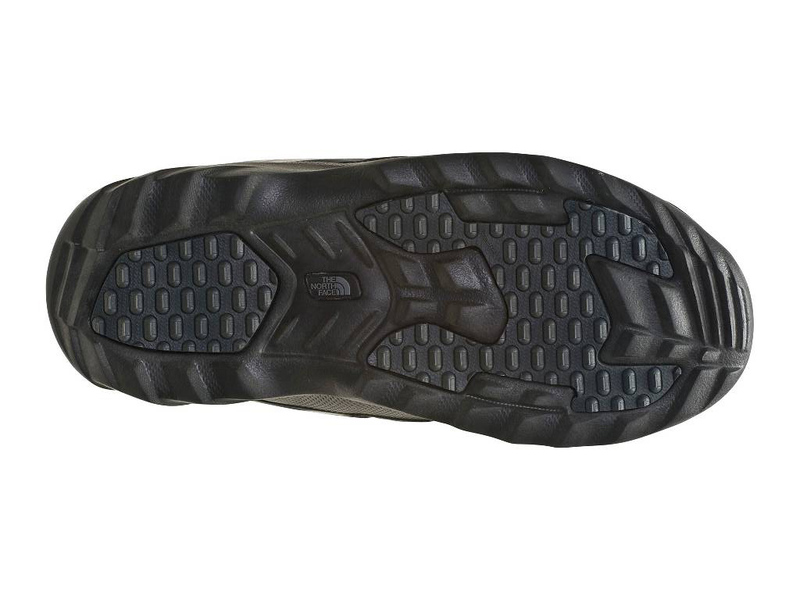 Ice Pick™ temperature-sensitive rubber pods on sole work to stiffen when temperature drops, providing secure footing with each dropping degree." 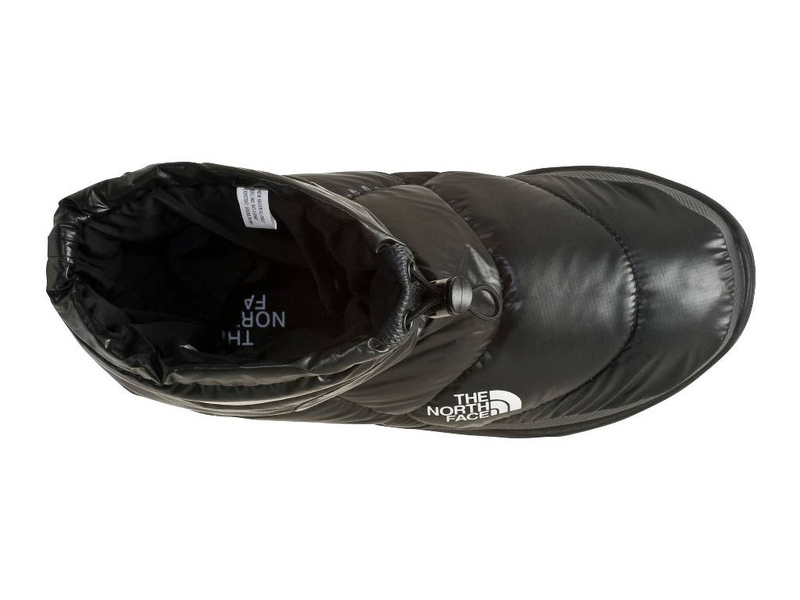 The North Face Nuptse® Bootie III features a water resistant 100% recycled P.E.T. upper and abrasion resistant rand. Down booties have an internal elastic band to secure ankles as well as collar drawcord lace with barrel lock. Northotic™ footbeds and cushioned, compression-molded EVA midsoles round out the list of features. Not your average tent booties, The North Face Nuptse® Booties are durable enough to relax around camp, outside in the snow all day. I often snow camp in the winter and like to get out of my boots after I get to camp, but most down booties are not designed for extended outdoor use. 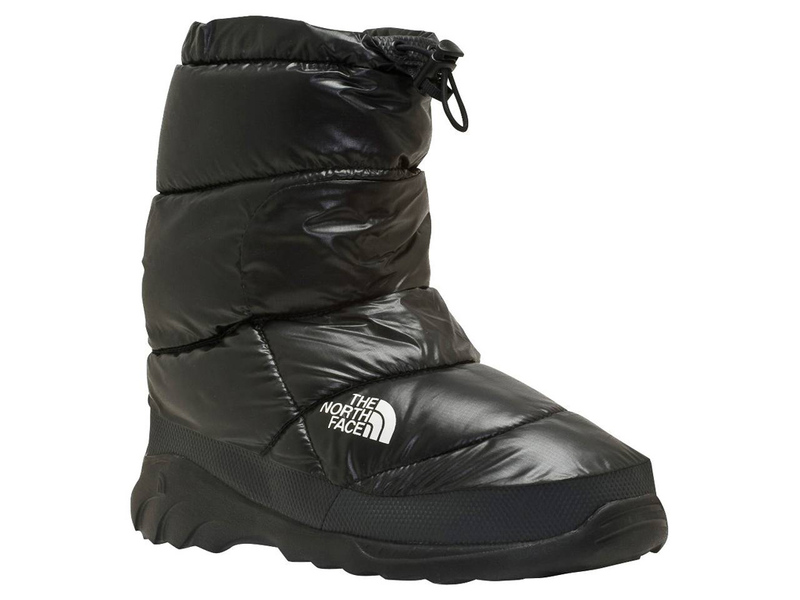 However, the rugged full rubber sole on The North Face Nuptse Booties should be perfect for my snowy adventures. 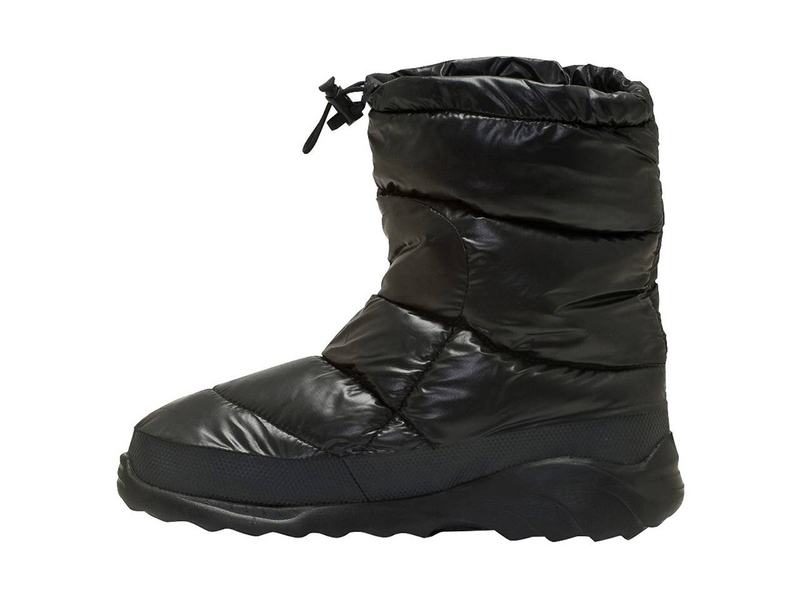 The Nuptse booties feel quite durable for down booties. The outer fabric is light, but should stand up to use in the snow provided they are not hiked in or dragged across rough surfaces. The lightweight rubber rand that goes all the way around the booties should provide protection as well. The best feature is the rubber sole. It is lightweight, yet feels sturdy and very grippy. The 700 fill power down in the Nuptse booties must be minimal, as they do not loft as much as I had hoped. They appear more as though they were insulated with synthetic fill, but still feel warm as soon as I put them on. They pack down to about the height of the rubber rand which is nice for trips where space is at a premium. These down booties have a removeable insole that is about 4mm thick at the toe and approximately 6-8mm at the heel. These should help increase warmth when walking on snow, but could be replaced with other insoles for greater warmth if needed. I really like the internal elastic ankle band, as it provides a secure fit. The top drawcord easily cinches around my calves and should seal out snow and drafts. The North Face Nuptse Bootie III's appear to be well engineered gear for backcountry winter adventures. I took my Nuptse down booties on an overnight Spring snow camping trip near Mt. Hood, Oregon. The temperature was in the mid 40's F during the afternoon and the snow was wet (fresh snow had fallen the day before). As soon as we arrived at our camping spot, I took off my winter boots and put the Nuptse down booties on. They felt warm and comfortable. The snow was soft and uncompacted and the down booties performed well. The upper drawcord kept snow out. The booties stayed dry all day despite traipsing around in the wet snow for hours. The temperature dropped below freezing overnight and I was happy to have warm feet in the morning as soon as I put the Nuptse booties on. Normally my feet are coldest first thing in the morning, but the down booties were perfect on this trip. Over the course of the trip, I dropped firewood on the booties, kicked frozen snow with them, and hit them with a shovel. Amazingly they held up perfectly to all this abuse. Not a scratch or abrasion on them. I will have to be more careful in the future, as I doubt they will be able to hold up to extreme abuse forever. They are not designed for that. Overall I am very pleased with the performance of The North Face Nuptse Booties. They meet all my requirements for relatively lightweight down booties. My only complaint is the lack of loft likely due to minimal down, but I'll have to wait for a colder adventure to see how warm they keep my easily chilled feet. 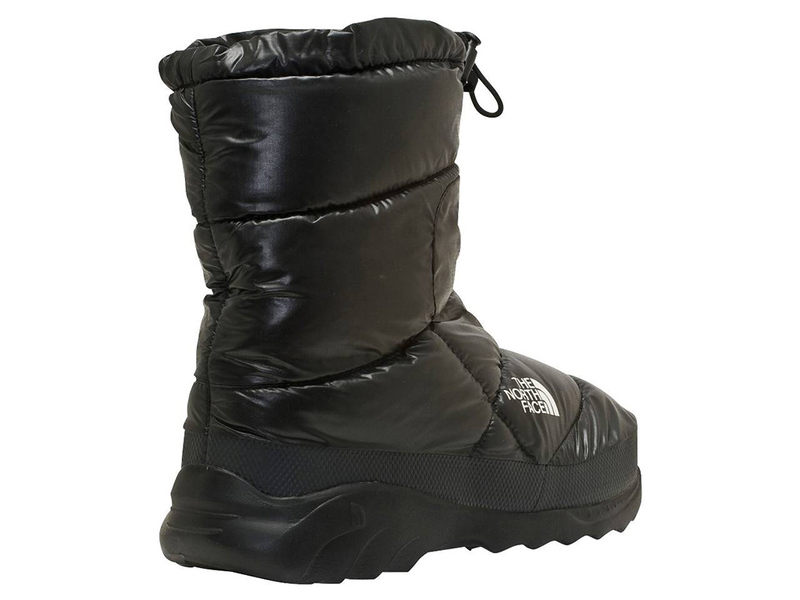 See Bennett Pass Snow Camping adventure where The North Face Nuptse Bootie III was used.